DREAMERS have accumulated over 1.4 million unique listeners on Spotify; their single “SCREWS” has over 2 million streams in its first month and reached #31 on the Billboard Alternative chart; and their new EP “FLY”was featured in NYLON‘s September 22 Soundcheck! Tickets are $12 and can be purchased in advance here. This is DREAMERS’ first nationwide headlining tour, and nearly every show has sold out so far! Watch this cool recap video of their recent show in Orlando by @benzuckerphotos. LY arrives as the second installment in a three-part series that began with LAUNCH, a powerfully charged EP released in July and featuring their single “SCREWS,” which is currently #31 at Alt Radio. The “SCREWS” official video, which dropped late last month, features cameos from some of the band’s friends and co-creators in the alternative music scene – Gnash, Papa Roach,The Griswolds, Joywave, The Wrecks, Steve Aiello, tour mates morgxn, Weathers and Rad Horror, and industry icons such as Matt Pinfield and Allison Hagendorf. 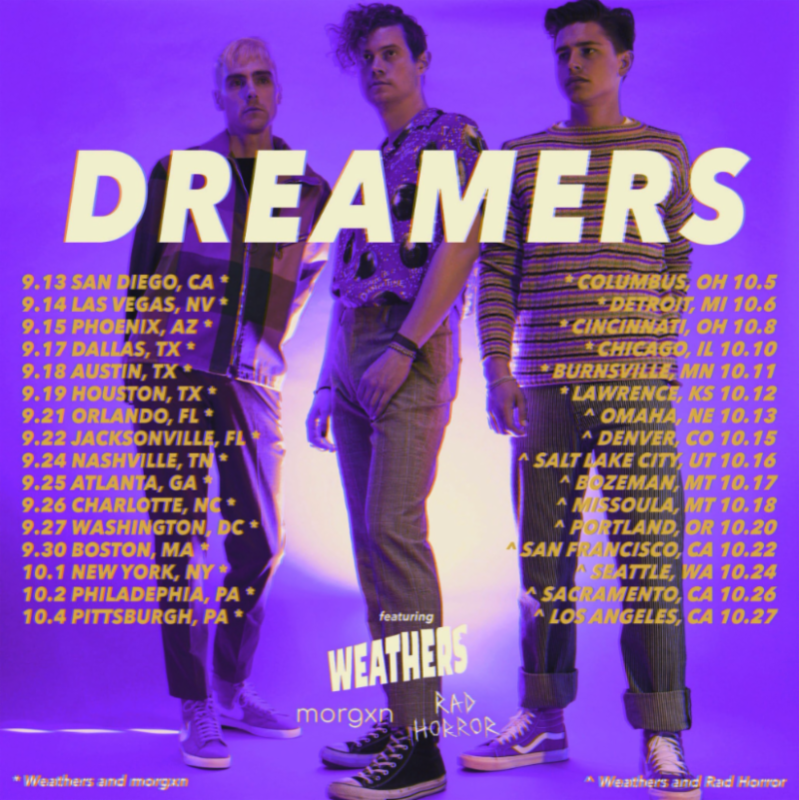 Los Angeles-via-Brooklyn trio DREAMERS have spent the past few years touring non-stop, playing everywhere from tiny bars and massive arenas to festivals such as Lollapalooza, Bumbershoot and Firefly. Along the way, Nick, Nelson and Jacob have shared stages with the likes of Stone Temple Pilots, X Ambassadors, The 1975, Bleachers, Atlas Genius Catfish and The Bottlemen, Weezer, and The Griswolds, while garnering coverage from Fader, Entertainment Weekly and Paste, among many others. In 2016, the band released their debut full-length album This Album Does Not Exist, which spawned a national radio hit, the electro-sprinkled pop gem “Sweet Disaster,” which hit No. 7 on the Alternative radio chart and was spotlighted on SiriusXM’s Alt Nation for several months. Three other songs also charted nationally: the ’90s throwback “Drugs,” the crooning ” Wolves (You Got Me),” which initially charted on Alt Nation in late 2014, when DREAMERS were still unsigned, and the soulful, brisk power-pop of their single “Painkiller.” The band recently wrapped a tour with All Time Low and their debut performance at Bonnaroo, and are gearing up to put out a trilogy of releases, beginning with LAUNCH (released July 13th), and FLY (out September 7th) with more new music to be released throughout 2018/2019 and a fall U.S. headlining tour.